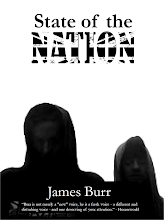 The forthcoming collection, State of the Nation, while not as heavily inter-linked as Ugly Stories for Beautiful People, does still have a few similarities to it, one being that it opens with a top-and-tail story. I've always liked these, whether it be the opening and closing stories in Bradbury's The Illustrated Man or the little bookends that you used to get with the old Amicus movies like Asylum or Tales From the Crypt. As a satire on contemporary British society, State of The Nation opens and closes with "Nanny Knows Best," a satire (obviously!) of the nation's seemingly inexorable descent into a nanny state and a depiction of what the end result of that process could be. It's relatively short so I'm hoping I'm going to be able to perform it live, at readings. But regardless, here for your viewing pleasure is a video reading of the opening tale from State of the Nation.